This site is about Dutch Delftware, especially that of Koninklijke Porceleyne Fles, Anno 1653 (Royal Delft). Wij heten u van hante welkom naar Delfthuis. Deze website beidt u veel informatie over De Porceleyne Fles. Dank u wel voor uw bezoek. Delftware is a generic name for many kinds of ceramics, of which Delft blue (Delfts Blauw) is the best known and most common. In its Golden Age in the 17th and 18th Centuries the city of Delft, in The Netherlands, was home to some 32 Delftware factories. By sheer quality and quantity Delft dominated the field of ceramics to such an extent that, even to this day, Delft and Delftware are household names and largely synonymous with tiles, tin-glazed faience, and blue & white pottery. "De Porceleyne Fles is undoubtedly responsible for the rebirth of our national industry. The Delft people of the past would be envious of our reputation." By 1919 this importance was recognised to such an extent that the predicate Royal was granted to the factory by Royal warrant. Since the end of the 19th Century many companies, both large factories and small workshops, have imitated Porceleyne Fles and tried to "steal its thunder". But few have come even close, and none have surpassed Porceleyne Fles. Now in its 350th anniversary year, Porceleyne Fles has much to celebrate, still leading the way into 21st Century ceramics. 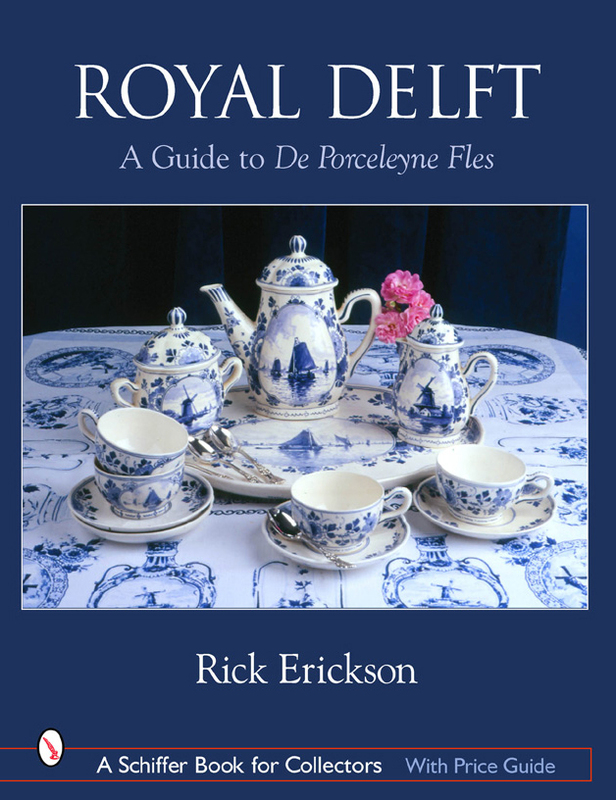 To coincide with the 350th anniversary of Porceleyne Fles this year, Rick Erickson has written a special book about Porceleyne Fles Delftware published in September 2003. The book is called Royal Delft: A guide to De Porceleyne Fles. This new book in English is a real collector's guide aimed at all collectors from novice to serious. It contains over 800 photographs (almost 700 in colour), many historical photographs, and reprints from factory sales catalogues. The book includes a goldmine of information about the thousands of different pieces made by Porceleyne Fles, as well as details about factory marks, year codes, and over 400 painters' signatures, plus a guide to current value and rarity. The hardbound book has 300 pages. This special Jubilee-350 year is giving impetus to organise an international club for Porceleyne Fles collectors. The idea is that such a group could help promote a wider understanding and appreciation of Porceleyne Fles, acting as a forum or venue for meeting other collectors, helping to encourage and assist in building collections, and exchanging information and knowledge. It is hoped to be able to have a regular newsletter and website. Again, anyone interested can contact the collectors establishing the group at tegel@delfthuis.com.